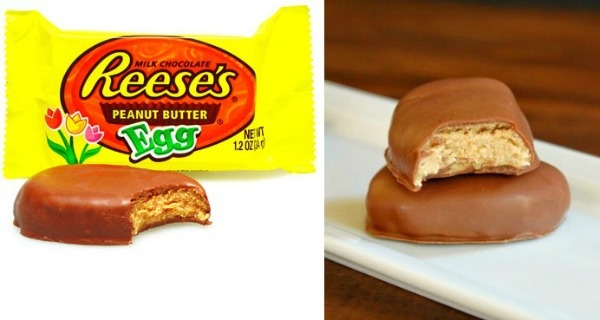 You've probably encountered at least one Reese’s peanut butter egg in your life. If not, you're missing out, buddy. 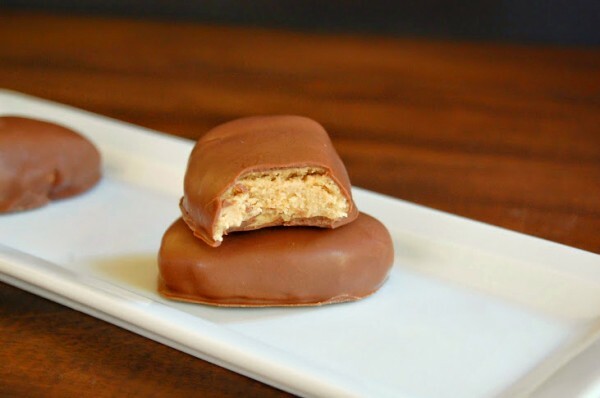 As a die-hard chocolate and peanut butter fan it was only a matter of time before I recreated these godly treats in my own kitchen. I had to find a way to thicken the peanut butter filling without adding a ton of sugar, as that tends to overpower the desired peanut butter flavor. Enter: powdered peanut butter (or “peanut flour”). This helped to both a) keep my filling peanut-buttery and delicious without additional sweetness and b) thicken my filling. Place peanut butter, butter, and brown sugar in a microwave-safe bowl. Heat at 50% power for 30 seconds and stir. Continue heating in additional 15 second intervals until butter is completely melted and stir the mixture until all the ingredients are incorporated. Stir in the salt until incorporated. Stir in peanut butter flour and 1/2 cup of powdered sugar until incorporated. Stir in additional powdered sugar, 1 Tablespoon at a time, until the mixture stiffens almost to play dough-like consistency. Cover bowl and place in fridge to cool, about 1 hour. Once cooled, scoop into a scant tablespoon-sized ball and roll into a ball. Place the ball in the palm of your hand and pat into an egg-like shape. Place onto a parchment-lined plate or baking sheet and continue with the rest of the peanut butter mixture. Cover peanut butter eggs and place in refrigerator or freezer until chilled, about 15 to 20 minutes. Melt chocolate in a double-boiler or microwave. I melted my chocolate at 50% power in the microwave and stirred, then continued melting at 10 second increments until it was mostly (85 percent) melted, then stirred to complete the melting process. 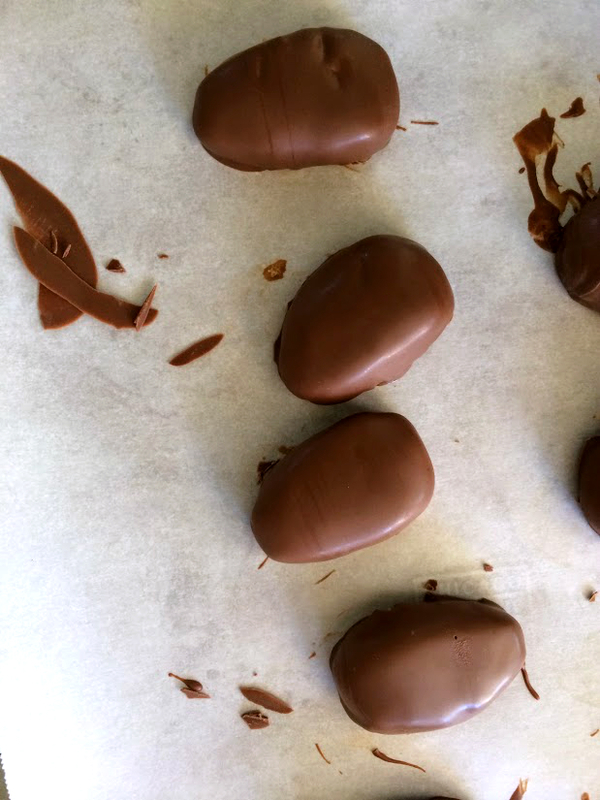 Remove peanut butter eggs from freezer and working one egg at a time, quickly but gently drop the egg top-down into the chocolate, then flip to coat the bottom and lift out of the chocolate. Give the egg a couple of gentle shakes to allow extra chocolate to drip off, then place chocolate-covered egg on parchment to dry. If necessary, use the back of a spoon or a butter knife to encourage your egg to jump onto the parchment. Repeat with remaining eggs until complete. Eggs can be made larger or smaller as desired, I got 10 eggs out of mine. If your peanut butter eggs begins to soften, return it to the fridge to chill and re-melt chocolate once the peanut butter has chilled to try again. If you aren't a fan of the "dunk and flip" method, you can also dip the bottom of the egg into the chocolate, lift it out, and then spoon additional chocolate over the top of the egg to cover. Give it a gentle shake to distribute the chocolate and shake off the excess. My chocolate-dipping "tools" usually consist of a plastic fork with the middle two tines removed and a plastic spoon. Although I've seen PB2 everywhere lately, if you can't find it, I've spotted peanut flour at Trader Joe's. You could also use finely ground almond flour.